Document your adventures as you save the Universe! This journal looks like the T-Shirt Flash wore in the film. Based on the cult classic sci-fi film Flash Gordon. Journal contains 320 lined white pages. It's Flash! Savior of the Universe, well his T-shirt anyway. Measuring 8-inches tall x 5-inches wide and containing 320 lined white pages, this terrific Flash Gordon Journal from Bif Bang Pow! is right out of the 1980 Flash Gordon sci-fi film. 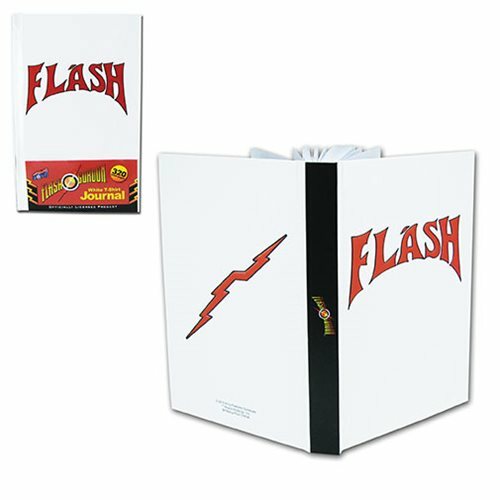 The cardboard hardcovers features an embossed Flash across the front and infamous lightning bolt on the back just like the T-Shirt he wore in the movie. Document your adventures as you bring peace to all corners of the Universe with your very own Flash Gordon White T-Shirt Style Journal! Ages 14 and up.